Let me start off this with a disclaimer. I am no style master. 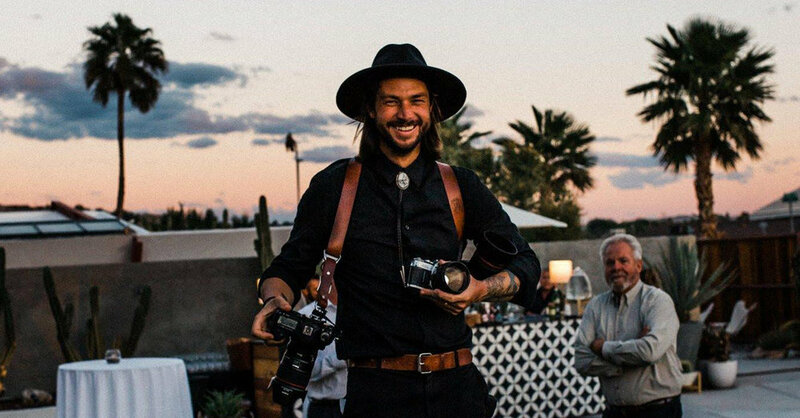 I’ve picked up a few clothing items throughout the past couple year’s shooting that have stood above the rest, but I crowdsourced a lot of ideas from the best wedding photogs & style masters in the industry. I saw women photographers sharing what they wear on Instagram and never see dude’s giving out recommendations. So for the guy who plays it safe, or wants to branch out a bit and find some great clothes for 2019, this is for you. TL;DR There’s a Pinterest link at the bottom for some visual ideas. The following words are just my ramblings about what me and some other photogs like and why. Enjoy! First off, I change my outfits based on the attire of the wedding. In my questionnaire I send a couple weeks prior to the wedding I ask what attire the guests were asked to wear. The last thing I want to do is show up casual and everyone is black tie. Also, indoor vs. outdoor venue will change things for me like do I wear a wide brim hat or pull my hair back (long hair, do care.) hahaha. So what makes this entire blog different than just a men’s wedding attire post? Everything needs to be on style, but durable and comfortable enough to hold up for 10 hour+ days. One last tip before we dive in. I bring a full set of spare clothes in my truck with me to my wedding. From a second set of shoes, a spare pair of underwear, pants, shirt, etc. What happens if I fall in a puddle, or I rip my pants trying to get a cool shot? I still have to photograph the rest of the wedding. I’d prefer to do that in some clean clothes looking fresh. I’ve also had some new dress shoes tear up my feet to the point of limping only 3 hours in to the wedding. I busted out my spare socks, and second pair of shoes and made it through the rest of the day okay. First up, let’s start with the easiest. Underwear. If you’re like me, you prefer boxer briefs. This got weird real quick. These bad boys aren’t cheap but you can feel the quality the second you put them on. Super breathable (KEY) and anti-microbial (meaning they won’t stink). At least invest in one pair just for weddings. You’ll buy more as soon as you get some. Go for the butter blend fabric. It’s so nice. Next your shoes. Probably the most important part of your wardrobe at least for the sake of your body. I’ve tried a ton of shoes. If you’re okay wearing running shoes, do it. No shame. It’s crucial we are comfortable. I can’t wrap my head around wearing running shoes to a wedding so I’ve opted for finding the best dressier shoes. To me the Cole Haan Grand series goes unrivaled. Super comfortable and classy AF. Go for anything with the word Grand in the product name. They’re not cheap but super well made and dressy and comfortable. Here’s where I got a lot of different opinions. The common thread was black. Skinny jeans, slacks or chinos were the most common. I prefer chinos, as I like my pant to be a bit heavier weight and tougher. For chinos I like Everlane. The Air Chino for summer weddings, and heavyweight chino for winter. Henry Tieu recommended Zara for stretch slacks. I’m gonna give some of those a try. They have tons of colors and fits. The boldest move is by Stephen Kim of @BreeAndStephen, he says “White pants!! 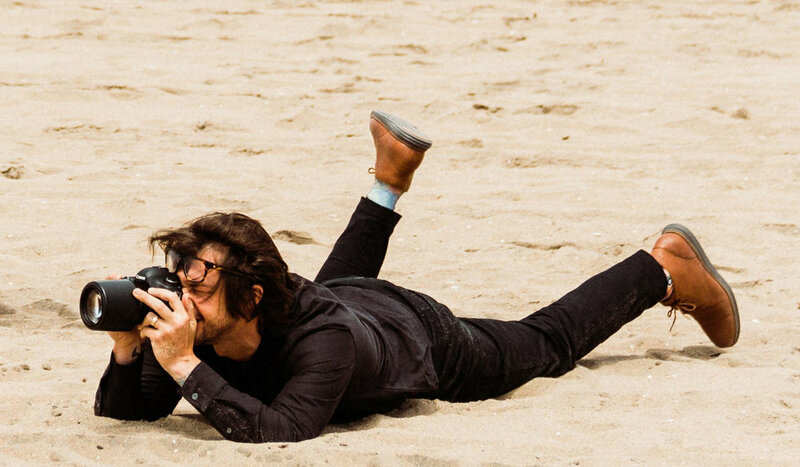 It’s a statement: I’m responsible enough to rock these and not get them dirty, so you can count on me to capture your epic moments.” Love that! Here’s the biggest differentiator across the reccs I collected. Some people said black t-shirt, some said a plain dress shirt, and others recommended a patterned long sleeve or short sleeve shirt. For basic tees, I love Buck Mason. Great quality and good fit. For basic collared shirts, I like Everlane. For printed shirts, Henry Tieu recommended Topman and All Saints, and Chris (of @chrisandruth) recommended ASOS. For accessories I LOVE Holdfast Gear. They make the best looking, highest quality straps in my opinion. I have the holdfast moneymakers to shoot two bodies and a holdfast money maker solo when I’m working with one camera. I get compliments on mine all the time. Adds to my gunslinger steeze. I also recently got a Medium pouch to attach to my moneymakers to carry an extra lens, flash, cards, batteries, speaker, etc. I’ve been rocking Bolos all year and been getting tons of compliment. It’s begun to be my calling card. It’s not for everyone, but don’t be afraid to throw on a skinny tie. Danny Gorman recommended Dazi for floral skinny ties. Dress for success. Dress for the job you wish you had, you can never be overdressed and all those other corny sayings. I also have been wearing Brixton hats for my outdoor weddings. Helps to keep my hair out of my face and adds a little style. Fits the bolo, gunslinger moneymakers and boots well. Henry had a good tip that I follow as well, match the moneymakers to the shoes to the belt. For me that’s Holdfast Water Buffalo Tan moneymakers, same Holdfast leather belt and brown shoes or brown boots. Now for the best part. How to put it all together. I figured it’d be best to show it rather than describe it. Got any good products I missed or great tips? Shoot me a DM on Instagram. Made it this far? Shoot me a DM and say what you enjoyed about this post. Thanks!